I very much look forward staining these things. The pale look of sanded, less-than-ideal mahogany needs to be hidden. Here's a quick picture of my progress with the tea table. Guild night tonight. I will be starting the acanthus leaves and knee carvings. 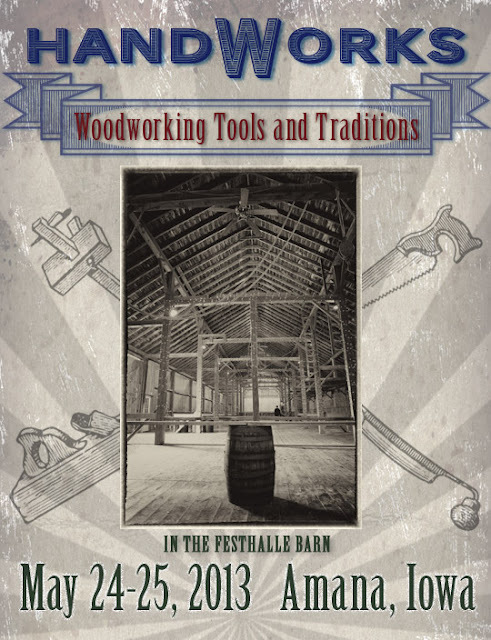 Additionally, I will be presenting at a Lie-Nielsen Handtool Event in Beverly, MA on Friday and Saturday. Stop by to say hello and check out Phil Lowe's Furniture Institute of Mass. and the other great vendors. My family and I will be making a trip to Iowa on Memorial Day weekend of 2013 for the Handworks Event. The event has a long list of hand tool vendors and enthusiasts. The door prizes are incredible. All you have to do is register and be present. This can be done through the website. Be there, or be out of square. 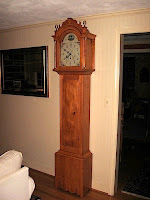 Bill spent a significant amount of time on the reproduction of this family heirloom. He certainly wanted to get it right. 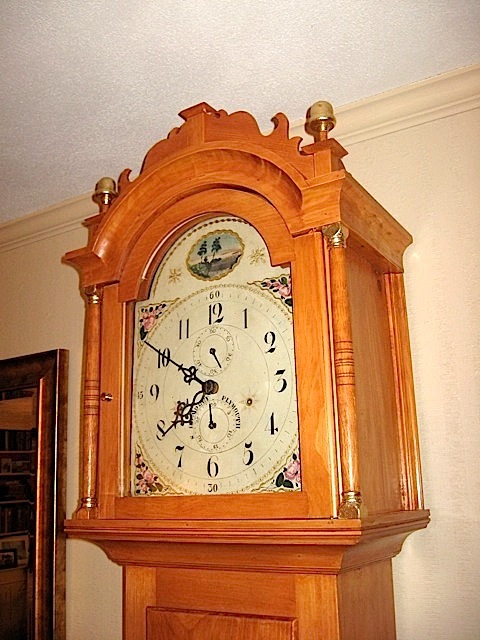 He went so far as to acquire an original wooden gear mechanism by Silas Hoadley. Most visiting lay people will take the highlights that the mouldings provide for granted. 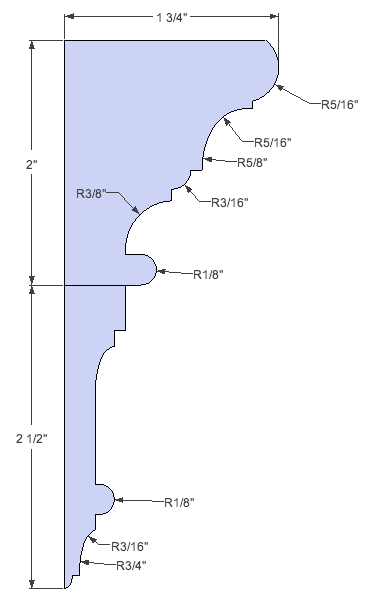 Visiting woodworkers will be impressed if he ran the moulding profiles in his basement vs. outsourcing it to a local shop. There is, however, a little secret that we all share: Freud was not responsible for the highlighting of these three cases. 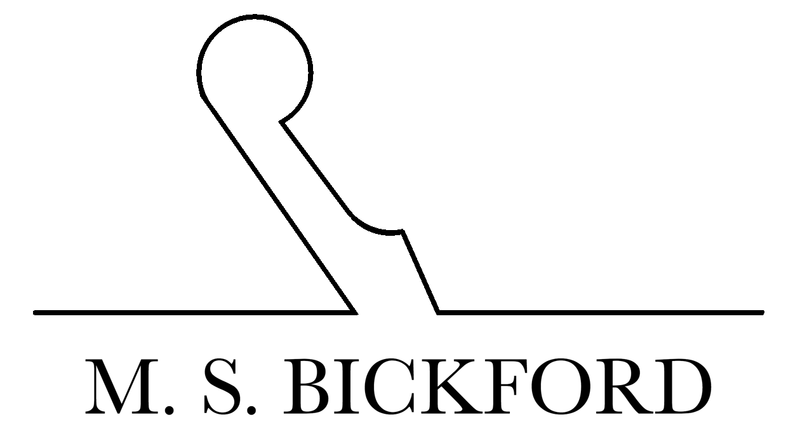 Bill did not use stock profiles, generic bits or run-of-the-mill skills. Bill made (most) of the profiles by hand. The answer, of course, is yes. I can't find a place that will deliver custom knives in less than 15 days. Bill, the first time user, took 4 hours. Last night was guild night in Haddam Neck. Don and Chris Boule are slightly ahead of me. We'll (hopefully) all be ready for our annual trip to the Northeastern Woodworkers' Assoc. 2013 Showcase in March. After getting shut out for ribbons last year we have all decided to step it up a notch. Don is making a "Dunlap" inspired highboy. Chris is making a "Chris" inspired lowboy. I am making a pie-crust tea table, which has lately taken a back seat to a bed, which has taken a back seat to class preparations. This last picture will give you an idea of the size of Chris' piece. Rabbets with a Rabbet Plane. One of my greatest pleasures is seeing woodworkers use a rabbet plane for the first time. I have witnessed a few hundred people go through the process and I love being present. It's so simple. Brian Eve of Toolerable is no different. He recently reconditioned an old rabbet plane and took a video of his first attempt. Check it out! I doubt he'll ever crave a fence for this task again. If you don't get it right on the first attempt, you will be fully confident that you'll get it on the second. On a side note, I'll take this opportunity to reiterate a point about antique planes: they can (usually) be made to perform as well as the planes I sell. Please do not think that you need my planes or those from Old Street Tool to get in this game. Start with antiques. We all did. If you feel like you're blindly fighting these tools I'll recommend that you make just one pair from scratch. The first time you have to fit YOUR wedge, bed YOUR iron or make your iron match YOUR sole you will work to a whole new level of tolerances. You will quickly learn about the significant amount of technology that is present in two pieces of wood and steel. Get in this game. Take control. I was in Newport, RI the last few days for a Lie-Nielsen Handtool Event. When I am at these shows I'm often asked about the relevance of the tools that I make in today's shops. The answers always seem clear to me. I'll take this opportunity to show you. A chest of drawers without the moulding is just, well, a chest of drawers. By adding the profiled shapes around the edges we are able to manipulate that rectangular chest into a piece of work that commands attention from the other side of the room. 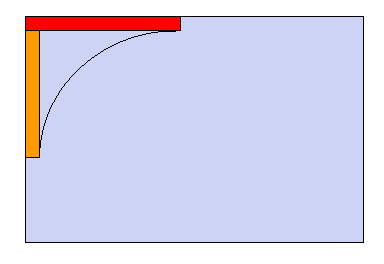 Why do we let today's router bit manufacturers dictate what those edges are going to be? After all, we don't do that with dovetails anymore and they're hidden. With the planes on my bench I can make everything that occurs along a straight surface, regardless of shape. 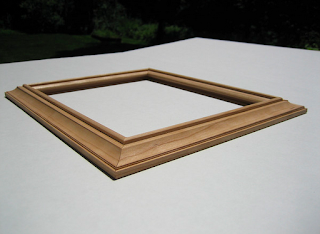 A moulding, any moulding, is just a combination of convex, concave and flat edges. That's exactly what these planes make. These planes allow you to make what you want, not what you have. This weekend I was asked the sharp follow up question: "So I can make everything I see in Home Depot?" I shyly responded that I actually couldn't make the new profiles you often see because they've been flattened out to fit in thinner material. The ogees have been squashed. 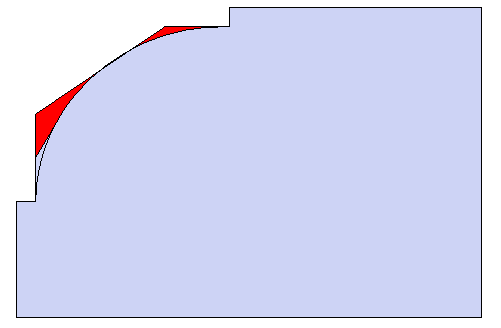 The curves have been reduced. The elegance has been withdrawn. "Can you show me what you mean?" I made this moulding during the slower times at my bench throughout the show. #10 hollow followed by #6 hollow. 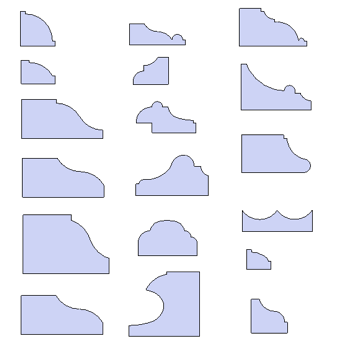 Here is the present day equivalent (the bottom portion) that I cannot make with my planes. I found this in my hotel room Thursday night. You'll notice that there are significantly fewer shadows. I will be attending a Lie-Nielsen Handtool Event this Friday and Saturday at the International Yacht Restoration School in Newport, RI. You must attend one of these shows if you're interested in working with your hands. This show in Newport is the perfect location because there is a ton of other attractions in the immediate area. If you come for a day you'll wish you could stay for the second. Use these shows to get yourself out of your comfort zone. I was at The Acanthus Workshop for a two day class on making mouldings with moulding planes. This was followed by a one day class on carving mouldings. I've had a few of these classes recently and, due to interest, have added another class at The Acanthus Workshop on October 6th and 7th with an optional 3rd day on the 8th. There are two spots available. Here are a couple videos from my class at Lie-Nielsen in July to give you an idea of the class. Bring some walking shoes if you come. I will be at the Lie-Nielsen Handtool Event at Hearne Hardwoods on October 5th. If you can't make it to one, go to the other. I have been at Lie-Nielsen Toolworks shooting a DVD about using moulding planes. This video will nicely supplement my book for several reasons. It is easier to demonstrate steering a plane that writing about it. The editing department is going to have a lot of work. It must be time for a weekend class. I'm heading off to Maine tomorrow morning for a weekend workshop. I will be teaching a Weekend Workshop at Lie-Nielsen in Warren, ME from August 18-19. These classes are a great opportunity for somebody that is interested in learning how to use moulding planes, specifically, hollows and rounds. 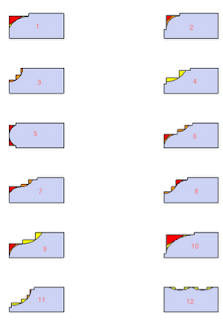 We will be using pairs of 6s, 10s and a rabbet plane to make more than a dozen very different moulding profiles. We will discuss plane selection (hollows vs. rounds, hollows vs. snipesbills, rounds vs. side rounds) and plane maintenance (from sharpening to seasonal maintenance). We will execute coves, ovolos, cove and ovolos, ogees and more. The purpose of the class is to build your understanding of how to lay out and execute simple moulding profiles, like coves and ovolos, and then build that knowledge into laying out and executing those that are much more complex. Are you interested in making your own planes? Come and ask questions. Are you interested in tuning up antiques? Bring them along. Though the class does not focus on this subject, it's inevitable that it will be discussed. Do you need to have your own planes? Absolutely not. I'm bringing all of these and many others for the students to use and, if you're interested, many will be for sale. The class will culminate with making this picture frame. Sheldon, my oldest son (7), is in the process of making some of his tools more accessible. He made his first through mortise to hold his float. We won't get into how long this took him. He has a better strategy for his second. The most difficult hurdle for a person that wants to start carving seems to be tool selection: "Where do I begin?" 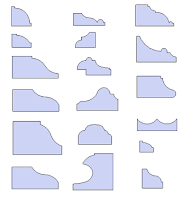 There are hundreds of combinations of sweeps and widths and gouge geometry and manufactures and etc. It's overwhelming to the woodworker who only wants to make a shell and does not know what to get in order to do so. The good news regarding this dilemma is that, once started, the answers to 'gouge selection' are always self-evident. You just need to start. You will never read a thread on a woodworking forum asking "which gouges should I buy second?" Over the course of the last 2 1/2 years I've been asked countless times "where do I begin with hollows and rounds?" Since announcing the release of my upcoming book, Chris Schwarz and I have been asked this same question a few times. I wrote a blog post at Lost Art Press in an attempt to address this concern. There are several ways to carve a ball and claw foot. Many remove the wood around the final form as they sculpt a block and excavate the ball from it. My way is much more calculated. It's very specific, stepped out, and would likely be easy to write about. At least it will be easier than trying to relate the artistic sculpting of wood to a person with minimal carving skill. Like carving, there are a few ways to address the use of the planes that I make. You can, of course, start a round on square stock. It usually takes 2-3 attempted passes to realize that this doesn't work well. You can start using rounds on chamfers and hollows on square corners as Graham Blackburn illustrated in Fine Woodworking years ago. I address this process in the book because there are times when I still use it. I, however, do not use this method extensively, certainly not exclusively (though many people do). The third way to use these planes is to start a round on a rabbet and the hollow upon a chamfer. This is the method to which I subscribe and to which my book, "Mouldings in Practice", will build upon. Using any of these methods you must treat the profile as something that either must be sculpted from the wood the same as a ball being held by a claw is to be relieved from a block or as I will teach. 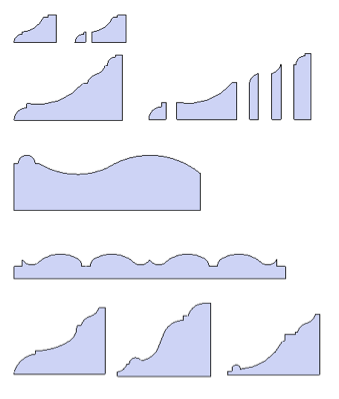 My book describes a very methodical set of steps for laying out simple coves and ovolos and translating that into very complex moulding profiles. I'm able to get very consistent and achievable results that rely very heavily upon the initial dimensions of the rabbets and chamfers, which are easy to make accurately. 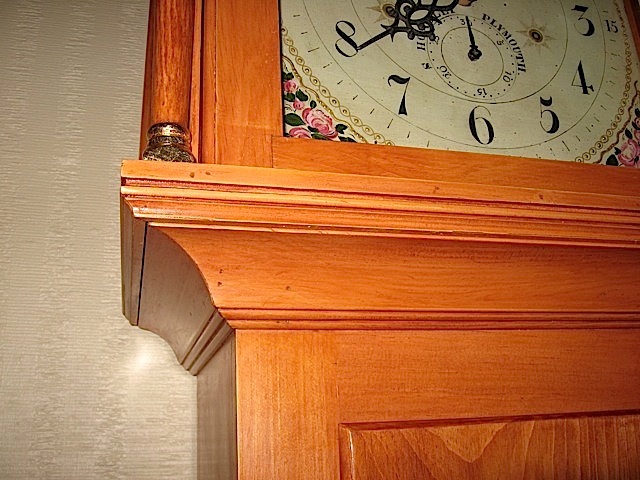 "Mouldings in Practice" will translate this method onto your bench and into your work. If you are fully comfortable with laying out and executing the following two profiles then this book may not change your methods. These profiles are somewhat similar. They both have a convex profile sitting above a concave. They each have one fillet. One, however has a smooth transition while one is interrupted. On closer examination you will see that one of the convex portions (on the left) is 1/4 of a circle while the other is only 1/6th. 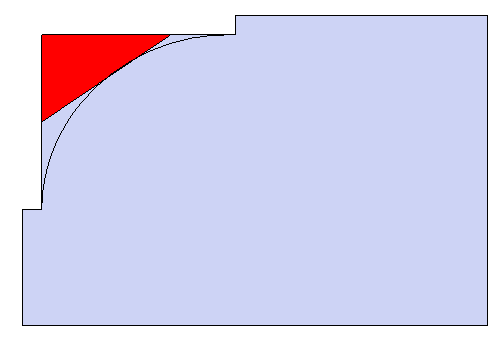 The angle of the concave portion is also very different, despite being the same portion of a circle at the same location. By manipulating the rabbets and chamfers that the planes ride along the profiles have been changed. Much of the book details this simple manipulation in order to gain consistent and achievable results. "Mouldings in Practice" details this method. If you fully understand the differences in laying out these two profiles above but have trouble translating the profiles to those below, then this book will help you too. "Mouldings in Practice" will teach you how to look at any profile and copy it. My method for teaching the use of these planes that fascinate me is similar to the way I carve a ball and claw foot. It is very methodical and easily laid out in a series of specific steps. You will learn to relate these steps to all profiles. This book is a prequel to other sources that address these planes. It does not address the classical orders or design. 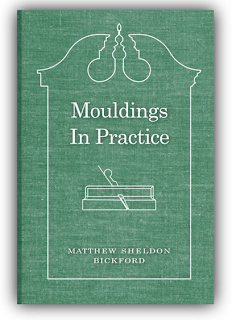 "Mouldings in Practice" will guide you through the steps of dozens of different profiles for practice. It will teach you how to achieve a desired result, be it Greek, Roman or you. Over the last few years I have often been asked for further direction regarding the process of using moulding planes that I describe and teach. A few years ago I started offering weekend workshops at a few various locations and pointed interested parties to those. These classes, of course, weren't enough because they're difficult to attend and, due to the fact that I'm the only instructor and need to supply all of the tools for everybody involved, small. 18 months ago I started to write what I thought would be a 10 page pamphlet I could give to those who asked. I spent this weekend at Lie-Nielsen's Summer Open House in Warren, ME with several friends and scores of woodworkers. I was again afforded the opportunity to put my planes in the hands of several interested woodworkers. Once again I was asked for further direction, but I fortunately abandoned that pamphlet after a quick conversation in a pizza "parlor" in Saratoga, NY with Chris Schwarz. This weekend was much different than any other in one grand respect. 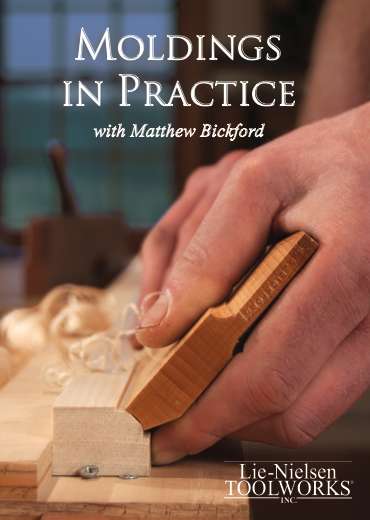 I'm happy to announce that Lost Art Press is now offering a book I wrote, "Mouldings in Practice," that details the entire process that I describe: from holding the planes to maintaining the edges, from a small cove to large crowns, from rabbets to snipes bills...the book is all inclusive. Chris has written about the specifics of the book on his blog. 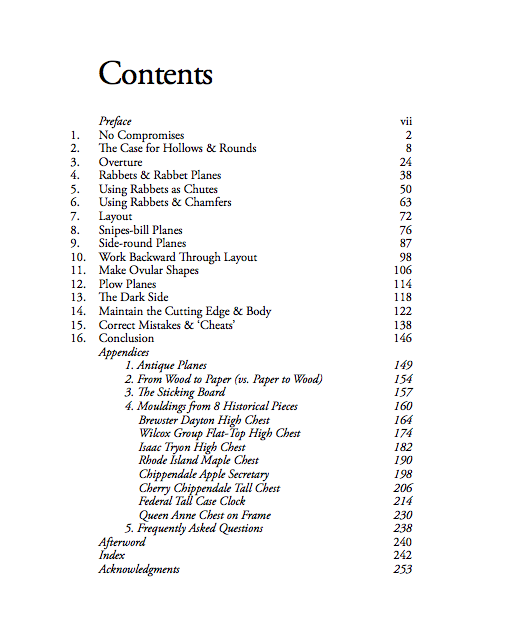 "Mouldings in Practice" is more than 250 page with hundreds of color illustrations and tons of pictures. Preordering the book through Lost Art Press means you will receive free shipping. The book will be carried by several different vendors: Lost Art Press, Lie-Nielsen, Tools for Working Wood, Lee Valley in Canada, and Classic Hand Tools in the UK. Additionally, a digital download of E.J. Warne's "Furniture Mouldings" will be available to those who order through Lost Art Press. This book is the perfect supplement to mine (or mine to his). It is more than 100 plates/pages of full size moulding profiles including a range of pieces from 17th century chests to 19th century tall clocks. Each plate probably averages 8 profiles...we're talking hundreds of profiles for those who can't get to a museum. I now have a specific place to point those who are interested in the tools and the process. The book will give you a significant base or knowledge before we meet in the future. Chris brought a printout of the book that I kept at my bench this weekend. At the very least the book gives me a reference so that you don't have to decipher the drawings on my sticking board and bench... and I'm excited about that. I woke up this morning intending to put myself in full moulding plane mode for Lie-Nielsen's summer open house. 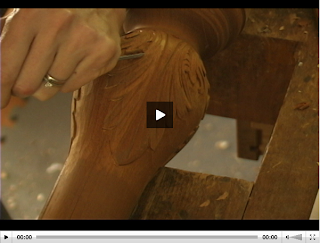 I checked my email and received notice that Mary May is now offering online instruction and videos for carving. I'm thinking about my tea table again. I met Mary in March at the NWA show in Saratoga. A quick perusal of the site indicates that this is right in my wheelhouse. I do, of course, wish the offering came out a month ago because she has a two part video that would have been a nice helping hand. I've enthusiastically signed up and, while fighting a terrible internet connection in my hotel room, am now trying to squeeze in a couple videos before the kids wake. This, combined with Chuck Bender's NoBSWW and the release Roy Underhill's Woodwright Shop on dvd, is very good news for me (and our often self-secluded and introverted community). Now I need to get ready for two days of talking woodworking with a huge group of enthusiasts who have traveled to Warren, ME and Lie-Nielsen. The wood is milled. The planes are packed. The company sign has been located. My family and I will be headed to the Lie-Nielsen Open House in about an hour. If you have the opportunity to swing by Warren, ME on your way to the grocery store or back from Home Depot you should. Chris Schwarz and Lost Art Press will be present with their good humor, great demos and various offerings. 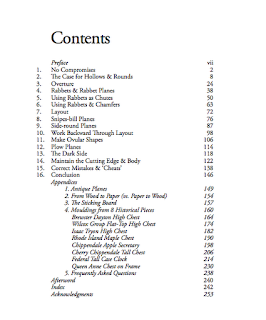 Included at his bench will be, I believe, a print out of my new book "Mouldings in Practice," which is at the printer. I think the opportunity to preorder the book is imminent. I will let him announce the specifics regarding dimensions, price, page numbers and special inclusions. I am excited. Peter Follansbee will also be demonstrating. If you've never had the opportunity to spend a few minutes with him, take this one (or another). You will learn; you will be entertained. You may even get him to sign a copy of his book "Make a Joint Stool from a Tree," also published by Lost Art Press. The list of other demonstrators and presenters is long. It is also quite different from last year. The best part of the weekend is being able to use any of their tools (and others) at one of several benches that are set up. Use them by yourself or use them while receiving expert instruction. After that, go see how they are made. You'll be impressed. 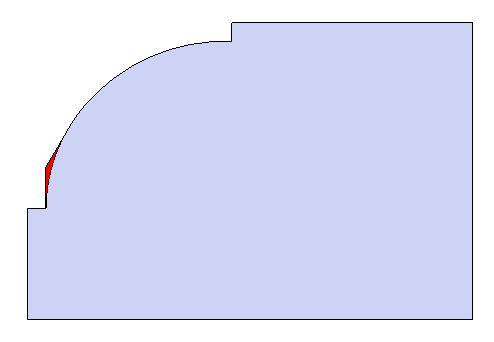 Many woodworkers use the opportunity to compare bevel down planes to their bevel up counterparts. Hold a #4 vs. a #3, bronze vs. iron, 55 degrees vs. 50 vs. 45. It's awesome. I have three plans: I'll have to talk myself out of getting the 10 1/4 for the 10th time. I'll be able to pick Chuck Bender's brain for free. Lobster Dinner. I'm heading to The Wooden Boat Show in Mystic, CT today. I have no doubt that I will see every one of you there. My favorite part of this hobby is executing things I've never done before. 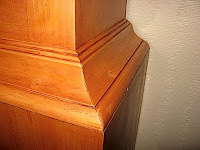 The sliding dovetails with curved shoulders on these legs is one of these instances. The first one will be fun. The third will likely leave me thinking "I'm glad I don't have to do that again." A B C D Exciting News! First we'll start with some awesome news. 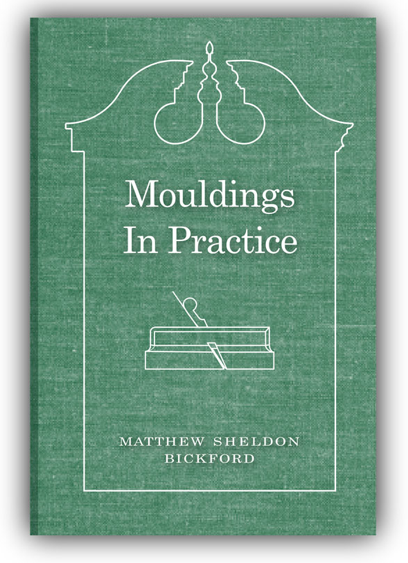 Yesterday Chris Schwarz announced the imminent printing of my book, "Mouldings in Practice" that he is publishing through Lost Art Press. The book is 99.9% complete. It will go to the printer in the next week or so, which means shipping is about a month away. I've seen the final document. Chris and company FAR exceeded my expectations. I'm very excited. On to the post. Last week we took a quick look at the waist moulding and support of Bill Anderson's corner cabinet featured on The Woodwright's Shop with Roy Underhill. Let's take a quick look at the two moulding that comprise the crown. 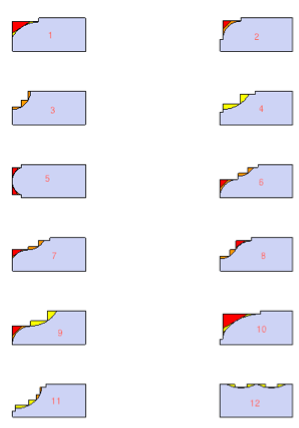 I'll show you the steps, you tell me which plane's you will use in terms of pairs 2, 4, 6, 8 and 10 (you'll also need a side round). Steps 1 and 3 will actually all be executed at the same time. I break it down into 2 steps because it shows the purpose of the rabbets. Step 1 includes the rabbets that separate the included profiles (coves from fillets, beads, etc.) Step 3 shows the rabbets that will guide the rounds. Step 2 is in the middle of the two because I got ahead of myself and didn't feel like redrawing.